If your using SuiteCRM for project management, and would like to more accurately track the time associated to projects, resources, and identify billable client work, then this is the module for you. An ideal application for Professional Services organizations and organizations who bill based on hourly work. This module makes tracking your project tasks associated to your resources in SuiteCRM a breeze! 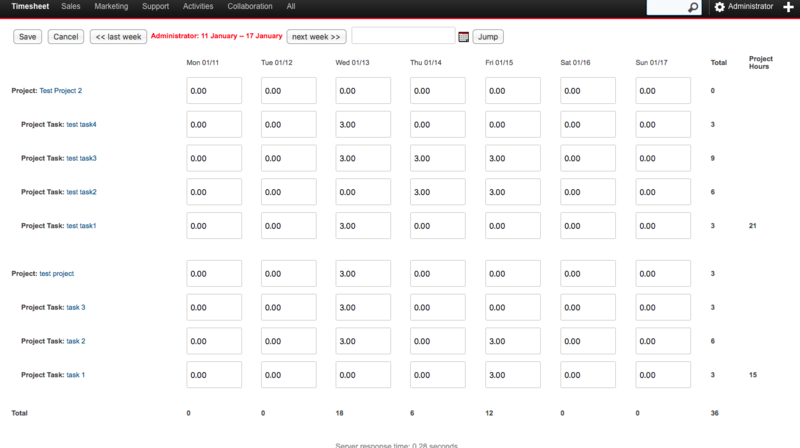 Additionally, you can easily convert your timesheets to invoices in SuiteCRM. Log Time on Projects, and Project Tasks - Easily add your time to projects, and project tasks for tracking. Log Multiple Times with the Matrix Views- Forgot to log your hours at the end of the week? No problem, log them all from a single view. After that, System will generate an invoice and move to the edit view of the invoice. Track Billable Hours - Track the resources on your team who are billable and update their profiles with their rate. Generate Invoices from Project Task Tracking - Generate an invoice to your customers from the time you track in your matrix and bill it to your customers. Setup Hourly Rates - If your hourly rates vary by resource or by user, you can set up a user profile rate for automatically billing in an invoice. Track Project Resource Allocation - Track your Project Resource productivity more accurately. Quickly Bill Customers - Quickly convert your project tasks and time spent into invoices. Improve Revenue - Increase the quality and accuracy of your invoicing and billing. Accurately identify how resources are spending their time and on what. Support for Multiple Billing Scenarios - Associating projects to your Sugar/SuiteCRM accounts enables you to easily bill different rates to different clients.